I doubt that I’m alone when I admit that, until recently, I had not thought much about the role and responsibilities of our state’s Lieutenant Governor. Senator Cyrus Habib, candidate for Lieutenant Governor, has changed my view—and likely that of many other of our state’s residents. Senator Habib plans to make use of his deep knowledge of legislative procedure, his understanding of business and international trade, and his strong interest in a more accessible and transparent government to make the most of the Lieutenant Governor’s portfolio. Senator Habib has represented the 48th District, including Bellevue, Kirkland, Redmond, Medina, and nearby communities for the past four years. He was elected to the House of Representatives in 2012 and to the Senate in 2014. He announced his candidacy for Lieutenant Governor on September 18, 2015. In March 2016, Brad Owen, the current Lieutenant Governor, announced he would not be not seeking reelection. In a crowded field of 11 primary candidates, Senator Habib was the top vote-getter; he faces pastor and talk-radio host Marty McClendon in the general election next month. 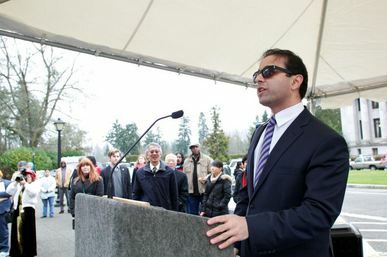 Senator Habib is already the highest-ranking Iranian-American official in the U.S.; if elected Lieutenant Governor, Senator Habib would be the second person of color to hold statewide elected office in Washington. Senator Habib lost his eyesight to cancer at the age of eight, but that did not interfere with his pursuit of education and public service. He received a B.A. from Columbia, a Master’s from Oxford on a Rhodes Scholarship, and a J.D. from Yale. He practiced law at Perkins Coie, representing startups and small businesses. 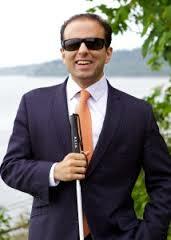 He has also taught courses on intellectual property and legislation at Seattle University School of Law. In his legislative career, Senator Habib has championed policies that support low income, disadvantaged and working families, including education funding, voting rights, environmental protections and transportation. He views service as a Lieutenant Governor as a way to continue and broaden that important work while serving as President of the Senate. “With a broader office and portfolio, I see the Lieutenant Governor as the state’s COO—‘chief opportunity officer’—and not limited to the interests of one legislative district, but the whole state.” In particular, he would support young people with disabilities or other challenges as they leave high school and seek higher education or other training. He is also excited about the Lieutenant Governor’s role in working on trade and economic development. In all of this work, he says he would be attentive to enhancing and improving the efforts of the state, rather than duplicating the work of existing programs or agencies.